ROUTE "91" - 01 OCTOBER 2017 - HARVEST Country MUSIC FESTIVAL (58 DEAD - 546 WOUNDED): "No Motives ... No Answers ... Eyewitness Reports Ignored"
An event ended at 9:58 PM & some attendees decided to head down to the casino to play some poker. On their way down, they passed right past the Paddocks's supposed room on the 32nd floor. It took them 12 minutes to get down to the poker room & after one hand of poker was won; it was 10:08 PM. NOTE: 9:58 PM plus 12 min. = 10:10 PM. THEN; they started and finished on round of poker and this guy says it is now 10:08 PM? Note: His times don't make any sense. BUT; he supposedly WAS there; and he reports that at SOME POINT IN TIME; he heard about multiple shooters. Decide for yourself. About this time, there was starting to be a lot more activity through the casino and now the reports suggested there were active multiple terrorists moving through the hotel shooting guests. Then twitter started showing up with feeds suggesting multiple hotels being attacked, bomb threats, and more. The following 6 people have died since the Las Vegas Massacre on 01 October 2017. Four attended the concert and survived the shooting, only to die in unusual ways. The Fifth (and the first to die) ... DOES have a connection to the event ... though all the threads have yet to be woven into the tapestry in play. Its too soon to say more than that. Kymberley & Danny both spoke about multiple shooters. The Carvers had a home & business near the venue ... a towing business ... which could make them privy to inside information. The Sixth, Orville Almon (67), was a very prominent music & entertainment attorney from Nashville who represented Jason Aldean & was the attorney for the Concert. WHAT ARE THE ODDS that he dies 20 days after Kymberley from the same cause ... "seizure in his sleep"? Almon sat in on law enforcement meetings. That was what he did for a living. These meetings were apparently "not normal". LAS VEGAS: 23 Oct. 2017 - 35-year-old Danny Contreras was found shot to death on Monday - 23 Oct 2017 - at 7:05 AM ... in an abandoned home in the 5800 block of East Carey Avenue, near North Nellis Boulevard. The coroner confirmed that Danny Contreras, 35, died of “multiple gunshot wounds” and ruled his death a homicide. Dennis & Lorraine were line dancing at the Vegas concert moments before rounds of shots sprayed the crowd. Dennis laid over Lorraine to shield her from bullets before they fled to safety hand in hand. Dennis (52) & Lorraine (53) owned a towing company in Henderson, Nevada where they lived part time. Henderson is about 10-15 miles southeast of the Paradise & the Concert's location. 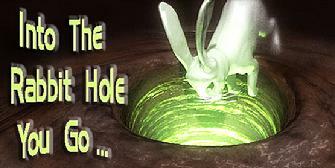 They died near their home in Riverside County, California. Couple had been married for 22 years. Kymberley Suchomel of Apple Valley, California, was found dead in her home, hours after her husband left for work. Ms. Suchomel gave a very detailed account of what happened in Las Vegas, insisting there were multiple gunmen involved in the shooting. Kymberley was organizing a group of the survivors to get to the bottom of what actually happened the night of the Vegas Concert "Hit". NOTE: From Paddock's valet receipts it appears he also had a penthouse suite in the Delano on the 40th floor - 61104. A cell phone charger was found in Paddock's suite that did not belong to Paddock . A cell phone charger with "SVR" technology (but no such phone) was found in Paddocks's hotel room. That particular charger is used to charge a CP502520 3.0V 600mAh Li-MnO2 Non-rechargeable Thin Cell Battery used by both US Special Forces and CIA forces. The lead engineer for this communication systems development was John Beilman. 03 October 2017 - FBI raided John Beilman's home; Beilman (age 60) was wanted for questioning by federal agents about a communications device found in Paddock’s hotel room. Note: What the feds were officially looking for, no one knows as the search warrant affidavit ... signed by the judge ... is still under seal. 04 October 2017 - Less than 12 hours later (around 5:45 AM), Beilman reportedly shoots his severely disabled daughter, Nicole (age 27) and then himself. Beilman's wife, Donna Beilman, was unharmed and says she didn't hear a thing. Note: Beilman's daughter was a complete invalid and completely dependent. So, Beilman might have thought that (for whatever reason) without him, his daughter Nicole wasn't going to get the care she needed or that he wanted for her. But; this is speculative at best. Whatever the feds were looking for; Beilman interpreted as highly threatening. He supposedly left a note which gave no reason for his and his daughter's death. 06 October 2017 - Pentagon awards $49 million contract to Ultralife Corporation. one of the most important tourist sites in the world”. "From about 50 feet in front of us, and a little to the right, fire crackers were set off. Let me repeat that… FIRE CRACKERS WERE SET OFF. I verbally stated “some a**hole just shot of fire crackers in close proximity to so many people”. I was literally pissed off. You could see Jason Aldean look to his left kind of startled by it, but he was also clearly irritated. I would say about 15 seconds later, the first volley of gunfire was released." We were rounding some sort of corner maybe- and I looked to the right and I saw this large cowboy sitting down with his legs spread, holding a blood-soaked woman. I thought to myself “we NEED to hide”, but as I looked quickly for somewhere to go, the gunfire once again got closer and closer. We couldn’t hide because they (and I do mean THEY) were chasing us. That exact moment is when I started to really panic. That is the exact moment in which I thought this was it, I was going to die, I was never going to see my family again. So, as we are running, we approach this fence where men are throwing women over, and we ran up to it as they had knocked It down, so we were able to get out. As we crossed the threshold of the venue, my mind went straight to other mass shootings and hearing the victim’s families in my head talk about how they never got to say goodbye. I did not want this for my husband (who was at work) & my grandma (who had my daughter, Scarlett). So, at 10:07pm I called my husband franticly leaving him a voicemail- telling him that I loved him and was in the middle of a shooting & I wasn’t sure if I would make it out alive. Next, while still running, I called my grandma to tell her the exact same thing. But the gunfire wasn’t stopping this whole time. It wasn’t ceasing. It wasn’t slowing down. And It was directly behind us, following us. Bullets were coming from every direction. Behind us, in front of us, to the side of us. But I know, I just know, that there was someone chasing us. The entire time I felt this way. The farther we got from the venue, the closer the gunfire got. I kept looking back expecting to see the gunmen- and I say MEN because there was more than one person. There was more than one gun firing. 100% more than one. ".. the gunfire got even CLOSER than ever before. It was RIGHT THERE. It was within the parking lot." Kymberley made her last post on 08 October 2017. The next day, her husband left for work at 4:30 AM. Four hours later, her Granmother arrived and found Kymberley dead. “At 10:00 they closed every exit on Las Vegas Blvd., every single one.,” he said. Palermo said that cops were directing people to go the wrong way and said that there were a lot of things that occurred that night that ‘didn’t sit right’ with him. Another witness who was with Kymberley's group also says ... mutiple shooters. GUESS WHAT? 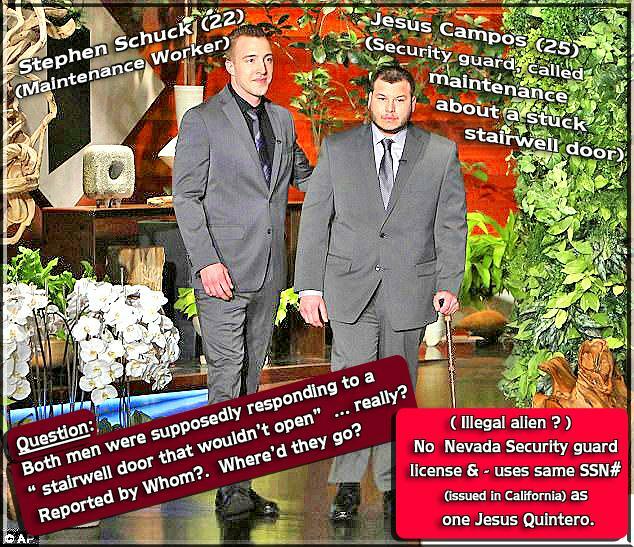 Campos is not even registered with the state as a licensed security guard. He bolted from his "news conference", SEEMS HE WAS HIDING OUT IN MEXICO. He returned in a car with California plates. He was in hiding from just about anybody who might ask specific questions... AND ... has yet to explain how a short, plump little guy escaped all those 200 rounds suposedly fired at him thru the hotel door and end up with only (supposedly) a grazed leg? What he was doing there on the 32nd floor, when did he get there, and what exactly went down. When did he call for help AND ... what "convienent" alarm went off ... from where and from whom and why? ... etc ... There is still no time stamp for Campo's phone alert. Was he shot before or after, when or what? "About that Cell Phone Charger ..."
03 October 2017 - FBI raided John Beilman's home; Beilman (age 60) was wanted for questioning by federal agents about a communications device found in Paddock’s hotel room. 04 October 2017 - Less than 12 hours later (around 5:45 AM), Beilman reportedly shoots his severely disabled daughter, Nicole (age 27) and then himself. Beilman's wife, Donna Beilman, was unharmed and says she didn't hear a thing. The "FBI" confiscated all the media devices (phones, laptops, etc.) they could get their hands on; from eyewitness Workers & vendors at the Route 91 festival. When they got them back; all messages and videos from the night of the attack were wiped clean. Note: Someone used Paddock's card key to access his room while Paddock was gone. one website says his source claims the same group that did this "HIT"; is planning a Nov. Hit for Times Square; no idea if this is legit. One crucial element missing from the hotel’s statement: What time Campos was shot, as opposed to what time he reported being shot. Wonder if Sheriff Lombardo finally called Laura Loomer? Also Breaking: A 2nd Shooter ? - Forensic acoustic proof of SECOND Vegas shooter. Differences in the speed of sound vs. the speed of the bullets from a known cartridge (.223 Remington, in this case), the time lag between the last bullet hitting the pavement and the last audible report of the rifle muzzle can be used to very accurately calculate the range of the shooter. This was supposed to be a MUSIC FESTIVAL ... what kind of sociopathic planet are we living on?!? “Freudian Slip” - Paddock's brother catches himself in mid-sentence admitting Paddock was an arms dealer. 4 GUNS MISSING? : Reportedly, 4 guns are missing from “the room” at the Mandalay Bay Hotel. The guy had a suite .. what room ... which of the "47" some odd guns were unaccounted for? ROCKY PALERMO: A man with extensive weapons experience, reported he was shot by a gunman on the ground near the Mandalay Bay Hotel? Other hotels were also attacked, just in advance of the Mandalay Bay Hotel attack, so that police would be diverted to the wrong hotel. Hundreds of people being sequestered against their will at the Bellagio Hotel. René Downs: “What they're reporting on the news is incorrect”. So is that why so many MS-13 gangbangers were let into the country and shipped all over the U.S with little or NO warning to the states they were "delivered" to in the dead of night? A "tide" of illegal immigrants embedded with future foot soldiers no one could accurately "vet" or keep track of? Did somebody need foot soldiers with no allegiance to the United States ... foot soldiers who might be able to recruit others once they got here & were up for hire ... who had no problem killing a few Americans if paid enough to do it? Did somebody want an army willing to fire on Americans; and stir up a little civil war or racial divide if possible? So ... who would benefit from that? Who would stand to gain? Maybe only those who felt America's United States had to go; the only thing standing between "them" and a "progressive", "New World Order"? WHAT'S THIS? More Shooters as witnesses reported? In addition to the 2 broken windows on the north and east walls of the 32nd floor, 3 windows appear to be missing on the west wall. 29th & 30th Floors? Why Did Police Say "no political affiliations"? He bothered to register to vote (2 days after his 31st birthday) & stay current since 1984. However, his age is listed as "66". He was supposedly 64 when he died. "The Planes .. The Planes..." ??? NOTE - World News reports CEO of MGM Grand - Which OWNS Mandalay Bay Casino Hotel Where Shooting Took Place - SOLD-OFF HIS MGM STOCK in the weeks before the attack. 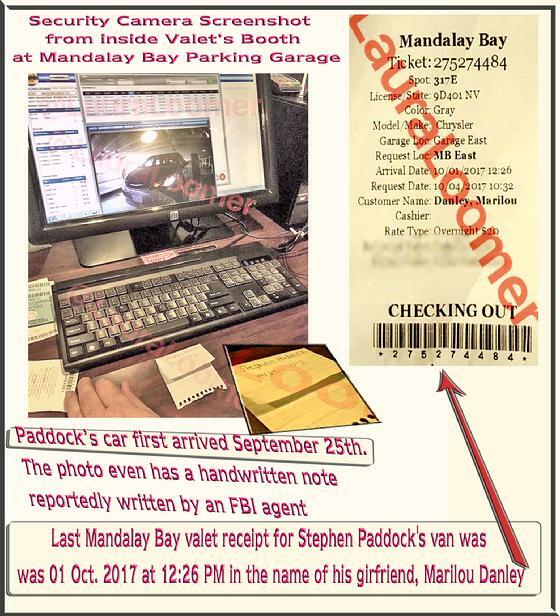 Mandalay Bay waiter says Paddock has food receipts charged to his room from the 25th & that's when he says Paddock checked in; a valet log record shows Paddock's car on the 25th ... with someone's handwritten note recording the time ... yet Law Enforcement says Paddock didn't check in until the 28th. or later. What happened? They lose the note? Another source told Laura Loomer that the gunman actually checked in on September 25th, three days before authorities said he did. BUT; it was only 3 days later on the 28th; that he was able to obtain the "connector room". BACKGROUND INFO - Some 12 of the rifles found in the hotel room had been modified with legally available bump-stocks, which allow semi-automatic rifles to mimic full-auto guns, firing up to 800 rounds a minute. Bump stocks cause the guns to buck even more, they tend to jam and they heat up really hot, really fast. They aren't that reliable. Hardly an "expert's choice" for a serious OP. 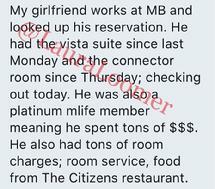 A N D ... he ordered for 2 additional guests on September 27th ... in the Mandalay Bay Hotel dining room. The waiter in the dining room said Paddock had checked in on the 25th of September. That was 7 days before the shooting and seven days BEFORE investigators say he had checked into the hotel. So, he had a week to set things up... and ... he had at least 2 friends. ALSO; it is being reported that Paddock was given to violent outbursts and was taking Valium for the problem. 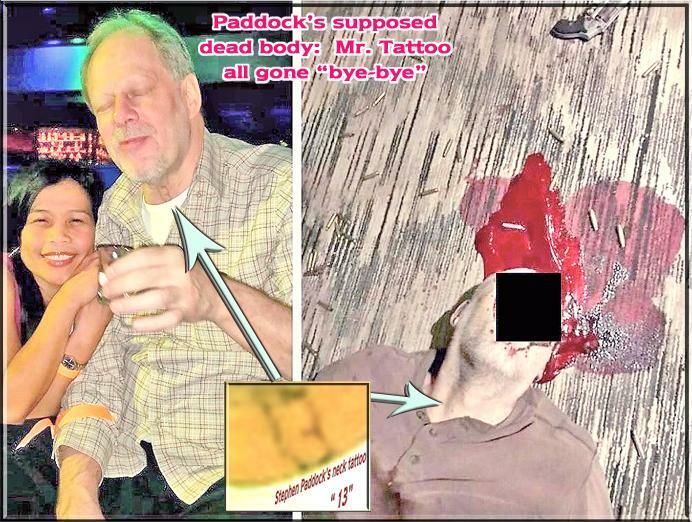 BACKGROUND INFO - Note: As early as 2010, Paddock could no longer fly his planes. His medical certificate expired, according to Federal Aviation Administration records, and there are no indications that he renewed it. On Paddock's 60th birthday, 09 April 2013, he flew to the Philippines with Danley on Japan Airlines for five days ostensibly to visit Marilou Danley's family. Supposedly this was her first visit to the Philippines. They went again for his birthday 2014. BACKGROUND INFO - Some 12 of the rifles found in the hotel room had been modified with legally available bump-stocks, which allow semi-automatic rifles to mimic full-auto guns, firing up to 800 rounds a minute. 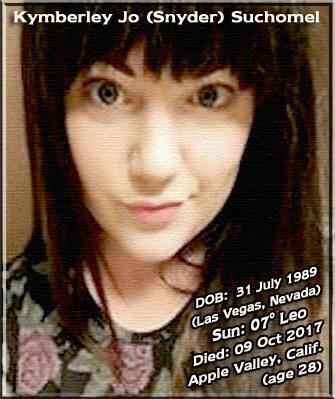 FROM NEVADA NEIGHBOR - AUGUST ORGANIZIED DISAPPEARANCE: Both Paddock and Danley disappeared from the home within a couple of weeks in August. BACKGROUND INFO - Paddock spent his 20s and 30s trying to escape the unpredictability of poverty. He worked nights at an airport while going to the California State University, Northridge, his brother Eric said, and then at jobs with the Internal Revenue Service and as an auditor of defense contracts. But it was real estate that ultimately lifted Mr. Paddock to financial freedom. To Mr. Franks, Paddock stood out because it was unusual for the landlord of a property that size to pay such close attention to the day-to-day running of his complex. “He was frustrated by people who did stupid things,” Mr. Franks said. He was also willing to fight to defend what was his. During the riots in Los Angeles in the 1990s, he went to the roof of an apartment complex he owned in a flak jacket and armed with a gun, waiting for the rioters, Mr. Franks said. Though Paddock might have adopted an accommodating attitude toward his tenants and dressed casually — Mr. Franks remembered him regularly wearing sandals and a sweatsuit — Mr. Paddock was focused and astute when he made deals. BACKGROUND & OTHER INFO - FROM CLYDE LEWIS' GROUNDZERO: An email that was sent to us. It was labeled “secret” and parts were redacted. We wondered who sent us the information – we tracked it to E-Mail by researcher Rob Gray from Texas. The e-mail stated that Stephan Paddock participated in illegal arms deals and that he secretly worked as an FBI conduit in the Las Vegas area. The email said that he took part in a weapons entrapment scheme similar to Operation Fast and Furious. From 2009-2011, under Operation Fast and Furious, the Bureau of Alcohol, Tobacco, Firearms and Explosives Phoenix Field Division, along with other partners, allowed illegal gun sales, believed to be destined for Mexican drug cartels, in order to track the sellers and purchasers. The e-mail goes on to say that Paddock thought he was engaging in another routine arms transfer. However, according to the e-mail, members of ISIS had learned about the scheme identified the negotiator Paddock as an agent – they showed up at the hotel, killed Paddock, and then used the weapons to carry out the massacre and then fled the scene. There were parts in the e-mail that confirmed much of what we were hearing and so I posted it on my Facebook page, in order to get the attention of anyone that would confirm or debunk it. This, I thought was an agent X moment, because it literally confirmed what little we got from our sources. It literally filled the blanks and while it most certainly is a well thought out conspiracy theory, the idea seemed so plausible and so real that it was unavoidably compelling. After we read and posted the e-mail we found out that the information was also posted on 4chan. A cell phone charger that doesn’t match any of the phones owned by the Las Vegas gunman was found in his hotel room, and the second, garage records reveal that during a period while Paddock’s car had left the hotel garage, one of his key cards was used to enter his suite. Las Vegas Sheriff Joseph Lombardo: ‘Look at the weapon obtaining, the amounts of Tannerite available – do you think this was accomplished all on his own, face value?’ he said. You gotta make the assumption he had to have help at some point, and we want to ensure that’s the answer. it's stranger than you can imagine." 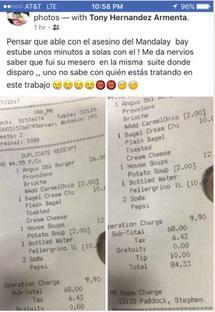 "Everything about this guy is wrong. Find out who he is." "This is not the work of a cook." Anonymous Post: What about the WEIGHT of all his "AMMO"? "He supposedly had near 1000+ POUNDS of 5.56X45, 7.62X39 and 7.62 NATO + 2 tripod mounted belt feds and hundreds of magazines". So was this just another "scheduled event?" "FBI" source: Paddock was found with Antifa literature & photos taken in the Middle East. WHAT? 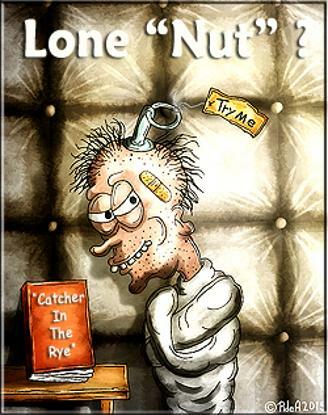 No copy of "Catcher in the Rye"? "A Depressed & Traumatized Public"
Girlfriend (Marilou Danley, 62) believed to be in the Philippines ... turned up in Japan. Room #32135. (Floor 32 room 135). Marilou's debit card was found in his room. Victims Dead so far: 58 victims + shooter makes 59. Killer, Paddock is being described as a multi-millionaire real estate investor and a past accountant for Lockheed-Martin. He has no military background. Was a hunter, a pilot and owned 2 planes. His only criminal record was one parking ticket. Paddock is said to have been going thru a divorce. According to his brother he had no known religious or political inclinations and was just a "regular guy". He has lived in Florida, Texas, and moved to Nevada to get away from the humidity found on the Gulf Coast. He was prone to video poker and a frequent gambler. He didn't use social media. Still, no known motive. Though ISIL claims Paddock had converted to Islam the month before ... no proof so far. Time of shooting may be 10:07 PM PDT; this comes from a witness. The police say they got the 911 call at 10:08 PM PDT ... then in an Oct. 5th update; said the first shots were fired at 10:05 PM. NOTE: This mass shooting was carried out in a planned, meticulous, manner ... it was an "OP". How and why was it conducted? Who was the hispanic woman saying "they" are all around us? Why was the reportedly hispanic girlfriend "out of the country"? "WHAT" was conducted by the dead shooter.... that's all we think we know for now. (Click Here For More info on the shooter from DailyMail article). Danley worked as a �Gambling & Casinos Professional� in Reno, Nevada. She is 62 & named as a "Person of Interest" by law enforcement. What Might She Have Known? Was she just for "window dressing" or; part of the show? 'She said they're all around us and we were going to die,'. Hendrick's mom (Shawn Hendricks) also witnessed the exchange. Fasten Your Seatbelts ... the Lunations are starting to get "Bumpy". Uranus & Neptune are gearing up for some serious changes. "JUST F Y I "